As documented in the literature by many users, MILabs VECTor/OI-CT preclinical system offers a powerful imaging platform for translational theranostics research. Its unique ability to simultaneously image multiple tracers, optical probes, and contrast agents at very high-resolution enables users to exploit the growing paradigm shift toward integrating therapeutics and diagnostics using single biochemical entities. The ability to image virtually all radioisotopes with known radiotherapy characteristics over a wide energy range, at sub-mm resolution. The ultra high-resolution capabilities needed to assess tumor enhanced permeability and retention (EPR) effects and monitor the modulation of the tumor microenvironment. The exclusive integrated multimodality imaging capability required to compile structural, functional, and molecular information of candidate theranostic agents, especially important for studying nanoparticles. 131I imaging at half mm resolution. This is the first time that this high-energy SPECT isotope, commonly used in the clinic for theranostic applications, can be imaged quantitatively in mouse models [1[, thus facilitating translation from preclinical research to clinical applications . 213Bi is considered a promising α-particle emitting radionuclide. Until quite recently, high-resolution imaging with this radioisotope remained largely elusive due to the high energy of its co-emitted photons (440keV). Now, with VECTor, 213Bi therapeutic tracers can be imaged with sub-mm resolution in mice . The 225Ac decay chain has considerable potential for use in radiotherapy due to the relatively long half-life (t1/2 = 10 days) followed by four alpha emissions and two gamma emissions from its progeny 221Fr and 213Bi. In 2017, Robertson et al. presented the first simultaneously acquired images of 221Fr and 213Bi at sub-mm resolution, making the effective use of the 225Ac decay chain in targeted internal radioimmunotherapy of mouse models possible . Other radiotherapeutics such as 111In, 177Lu and 118Re are also routinely imaged at high resolutions with the VECTor system , , . One of the other established radiotherapy isotopes, 90Y, is more challenging because it’s a virtually pure β-emitter. Nevertheless, VECTor users will have access to all of the best modalities for 90Y imaging: whether through low-energy bremsstrahlung SPECT, PET by imaging the low-abundant 551keV photons, or by using VECTor’s optical Cherenkov luminescence imaging (CLI) technique . Vascular density: Since the VECTor/CT is equipped with a high resolution ultra-fast DCE-CT, it is possible to study the regional oxygenation status within a tumor. This has great potential benefits in radiotherapy, because well-oxygenated tumors respond better to radiation treatment. Moreover, this theranostic approach using DCE-CT imaging enables the assessment of vascular remodeling under treatment . Tumor heterogeneity: Intratumoral distribution imaging of radiotherapeutic agents is important in theranostics since overall tumor uptake is not an ideal measure for therapeutic efficacy. With its industry-leading proven 140 µm ex vivo SPECT and 250 µm in vivo SPECT resolution, the VECTor system is arguably the only preclinical system suited for individual quantitative tumor characterization . Perfusion imaging: An outstanding capability of the VECTor system is the ability to simultaneously image co-injected PET and SPECT tracers. This exclusive capability can be utilized to monitor different molecular functions at the same time. E.g. a multi-institutional research team of five academic institutes in Japan developed a method to simultaneously study vascularity and hypoxia in tumors using VECTor’s Concurrent PET/SPECT capability . Concurrent PET/SPECT of co-injected radiopharmaceuticals makes it possible to obtain perfectly co-registered spatial and temporal images of different functional and molecular functions (e.g., perfusion, metabolism, apoptosis, angiogenesis, hypoxia, receptor-ligand interactions), all of them important characteristics for the evaluation of candidate therapeutic agents. Moreover, PET and SPECT tracers and their analogs, can be compared under the same physiological conditions. This uncovers a new field of research opportunities such as simplified switching from preclinical SPECT to clinical PET, or comparing and selecting 177Lu-, 131I- or 69Ga-nanobodies for theranostic applications [2, 12], or the simultaneous assessment of tumor oxygenation with 99mTc-HAS and tumor hypoxia with 64Cu-ATSM , plus comparing 111In-immunoSPECT to 89Zr-immunoPET , and evaluating the effectiveness of 99mTc-duramicin and 18F-FDG imaging for detecting early tumor response to targeted therapy . SPECT/PTT. 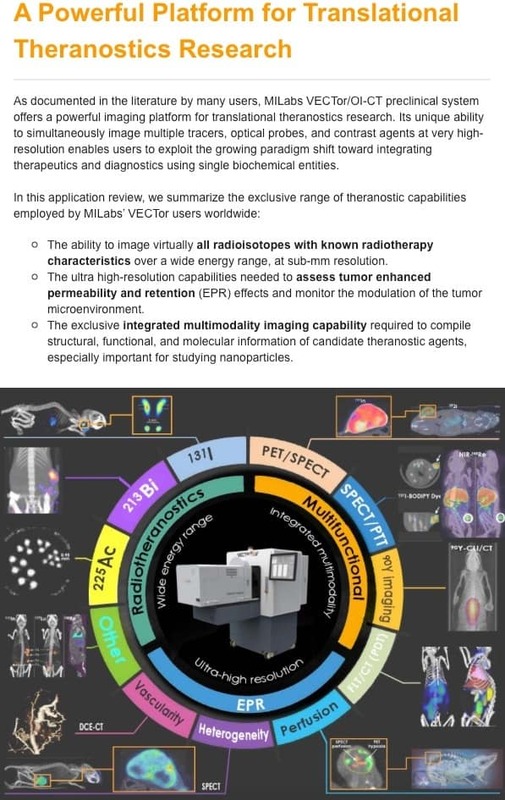 Vector’s hybrid radionuclide/optical imaging capability enables to exploit the synergistic therapeutic effect of multifunctional nanosystems, such as those armed with RIT radioisotopes and combined with photothermal therapy (PTT) to enhance the effect of RIT-irradiation with NIR light . Also, it has been demonstrated that the radioiodination of fluorescent probes such as BODIPY, in combination with multimodal PET/SPECT/Optical imaging, enables bridging the gap from theranostic bench research to preclinical and even human clinical applications . 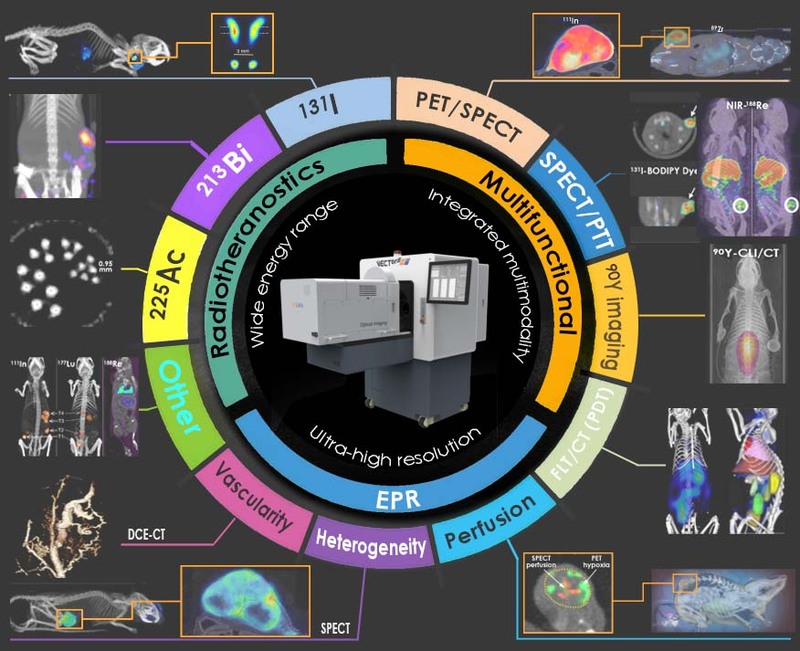 Multimodality Y-90 imaging: While 90Y is a theranostic agent which is being used clinically for direct radiation therapy, or radioimmunotherapy (RIT) and peptide receptor radionuclide therapy (PRRT), it is a challenging radiotracer for conventional nuclear imaging systems. Therefore, for preclinical applications, Cherenkov luminescence imaging (CLI) has recently attracted quite some interest but it is only a 2D imaging technology. On the other hand, tomographic imaging is possible with sensitive SPECT (low-energy bremsstrahlung imaging) and PET (low abundant 511keV detection) . In short, VECTor is the first and only preclinical system suited for qualitative and quantitative radiotherapy imaging of 90Y. FLT/CT (PDT) tomography: On the VECTor/OI-CT platform, the implementation of Fluorescence Tomography or FLT (also called Fluorescence Mediated Tomography or FMT) is complemented by in-line CT imaging. This hybrid design enables organ and tissue segmentation, which drastically improves the fidelity of 3D tomographic fluorescence reconstructions to visualize the selective accumulation of optical entities in tumor tissues. This can eventually be followed by NIR irradiation to produce singlet oxygen to induce cell death (the photodynamic therapy or PDT concept). Also, it has recently been demonstrated that elimination and retention of various fluorescent labeled entities, such as indocyanine green (ICG), quickly degradable nanogels (NG) and slowly degradable microbubbles (MB), can be studied with FLT/CT making this NIR hybrid fluorescence tomography technique a possible safe alternative to radioisotope imaging . As demonstrated by its global users, VECTor/OI-CT’s ultra high-resolution multimodality imaging capabilities bring many aspects of theranostic research to the most frequently used animal model of human oncology – the mouse. Challenging applications involving high-energies from non-conventional radiotherapy isotopes, or monitoring the intratumoral distribution of candidate therapeutic agents, and the design of multifunctional nano-therapeutics, are all made simpler by the use of MILabs single integrated hexamodal VECTor/OI-CT imaging platform. de Swart et al., J Nucl Med. 2016; 57(3): doi: 10.2967/jnumed.115.157685. Epub 2015 Dec 3. Krasniqi et al., EMIM 2016, ESMI, 2016.